You can choose from 3 carriers (United States Postal System (USPS), United Parcel Service (UPS) and Federal Express (FedEx)) when ordering "Ship to Me" products. 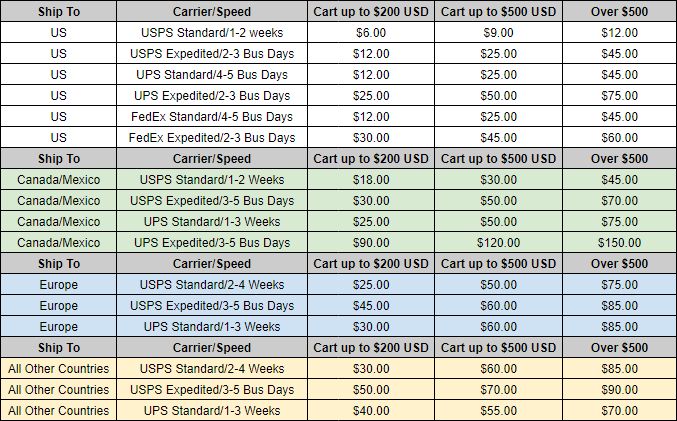 For each carrier, you can choose Standard or Expedited shipping speed. Details about prices, speed and tracking capabilities are included in the table below. The options available for your country will appear automatically during the checkout process. Every piece of sheet music we sell, regardless of format, is ALWAYS "In Stock". There is no such thing as "Out of Stock" when ordering from Art of Sound Music! All sales of music and merchandise are final. Defective items may be exchanged for a new product, or may be replaced without return at the discretion of the publisher.